Good morning all, it's time for another fresh challenge here at DYSU! We had some fabulous Vintage themed creations last week, making it so hard for us to choose the Top Three! Thank you all for continuing to inspire and create with us here at DYSU. 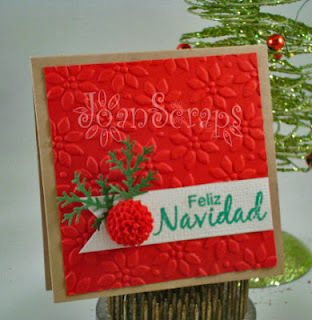 This week we have the theme of using Embossing in your creation, either dry or wet! So, dust off those dusty embossing folders, and jars of embossing powder and get embossing this week! For this week I have a very quick and easy mini card. It's a 3X3 card emsossed with a Satmpin Uo Poinsettia folder. It's perfect for mass producing it for Christmas. I wanted to use a small poinsettia but didn't have any at hand so instead I used a polymer flower I made. I love your polymer flower Joan, what a lovely festive card! This is so pretty Joan. Gorgeous embossed panel and that flower is awesome. Visiting from DYSU and I like the Poinsettia embossed card. I'm a SU Demonstrator and need to use the Petals-A-Plenty embossing folder with the pretty Poinsettia look so you've inspired me. This is so pretty. Love it. Love that background.